I love Halloween. It’s actually my birthday. Maybe that’s why I always look forward to coming up with new pumpkin decorating ideas each year. 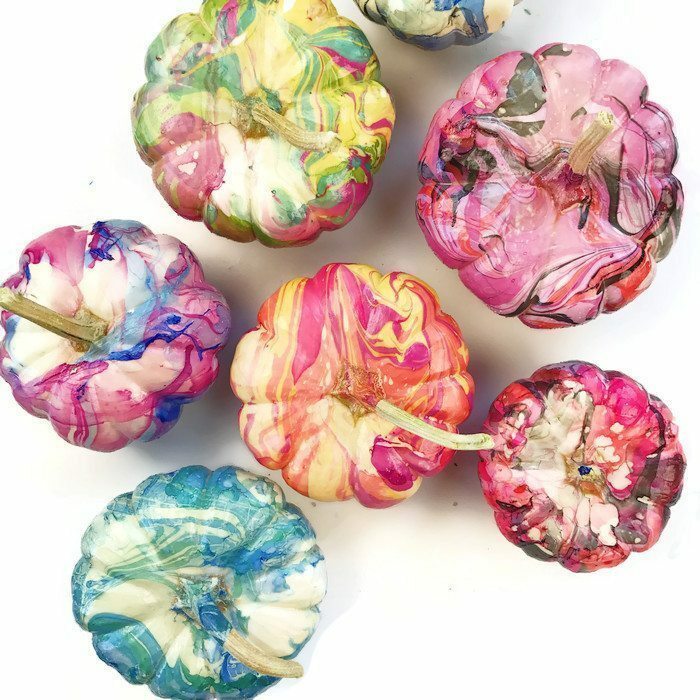 I’m a big fan of no carve pumpkin ideas as well as colorful pumpkins so I combined the two to make these fun marble pumpkins. 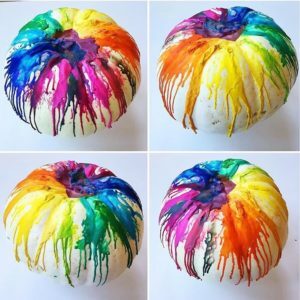 It’s actually really easy to marble a pumpkin. Once you do one, you’ll probably want to marble about a dozen pumpkins so make sure you buy plenty…it’s addicting. Mini pumpkins – Look for pumpkins that have a stem, it makes it easier to dip them. I found mine at Trader Joe’s. If you can’t find white, just spray paint some orange ones. I like this white flat spray primer. Nail polish – I used Sally Hansen Extreme Wear Nail Polish. Not all nail polish brands will work. The Sally Hansen brand is known to be one of the best brands when it comes to nail marbling which uses a very similar technique. The Sinful Colors brand also works great. Water Container – Make sure it’s deep enough to fully submerge a mini pumpkin. Gloves (optional) – these are good to use if you can’t find pumpkins with long stems). Fill a container with room temperature water. It’s important the water is room temperature so the polish can spread easily. Open the polishes that you’ll be using. You need to work fast. I used 3-4 colors on each pumpkin. Make sure the room you’re working in is well ventilated!! With the nail polish brush close to the water, shake the brush and let the polish fall into the water. Be sure the brush is close to the water otherwise the polish will sink to the bottom. Add additional colors and work quickly before the polish can dry. Holding the pumpkin by the stem, submerge the pumpkin into the water. It’s best to dunk the pumpkin sideways if you can otherwise most of the polish will end up on the bottom of the pumpkin. Once the pumpkin is covered, remove it from the water. 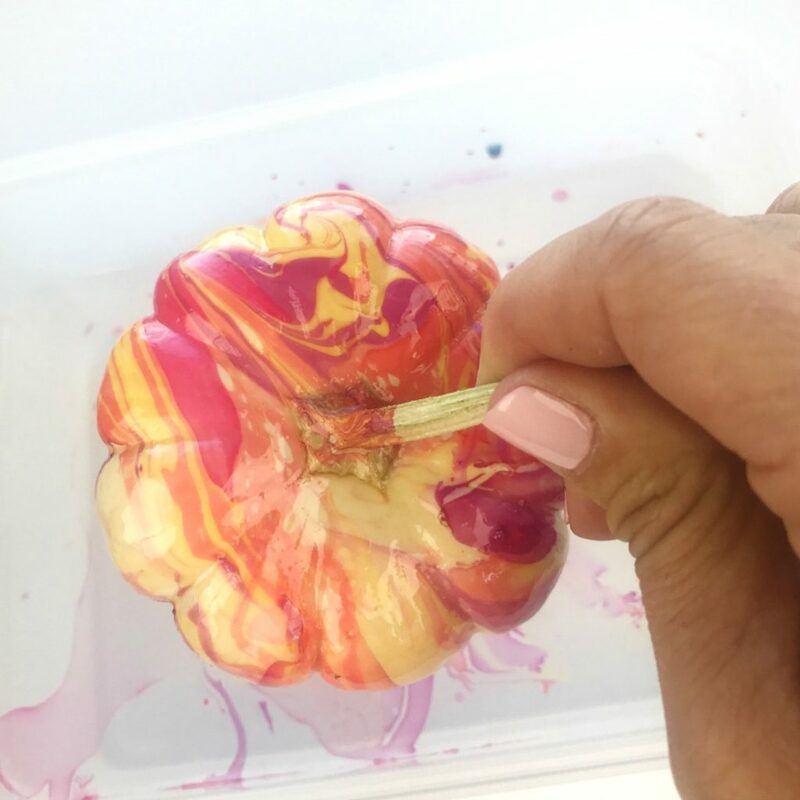 You can wipe away any excess polish that is hanging off the pumpkin with a Q-Tip. I dried my pumpkins on a piece of foam board I had but you could use wax paper with cardboard underneath. It took about an hour for them to fully dry. The bottom of the pumpkin took the longest. 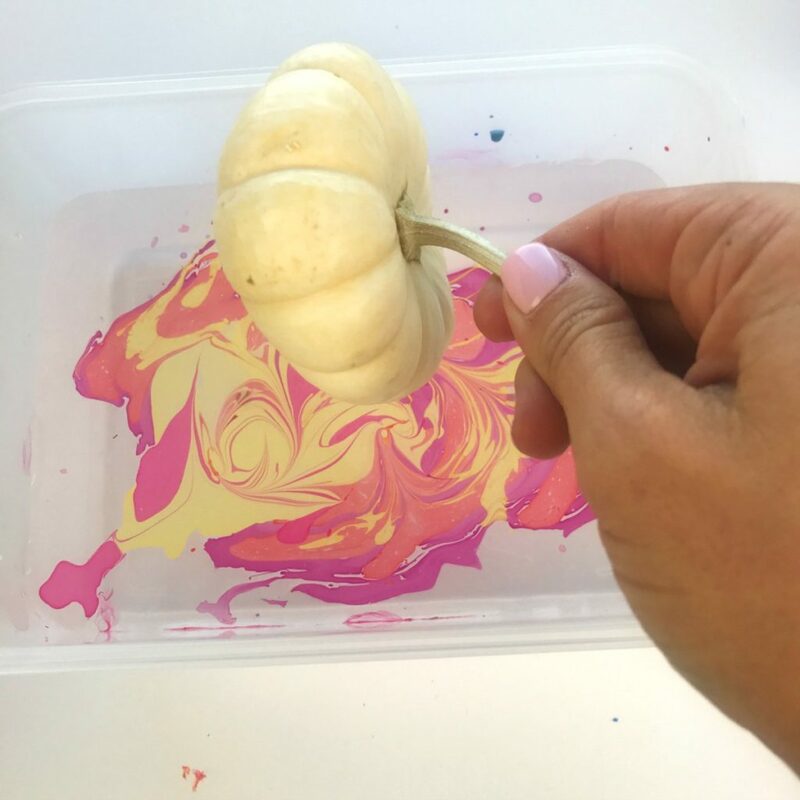 To clean the water before you marble the next pumpkin, simply take a Q-Tip and move it around the surface of the water to collect any leftover polish. Doesn’t that look like a fun fun Halloween craft! 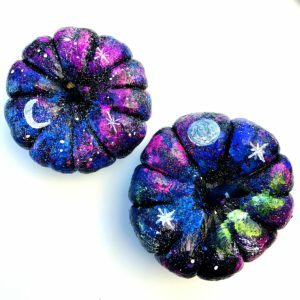 If you are looking for another colorful pumpkin decorating idea, you also have to check out my galaxy painted pumpkin tutorial and my melted crayon pumpkin tutorial. 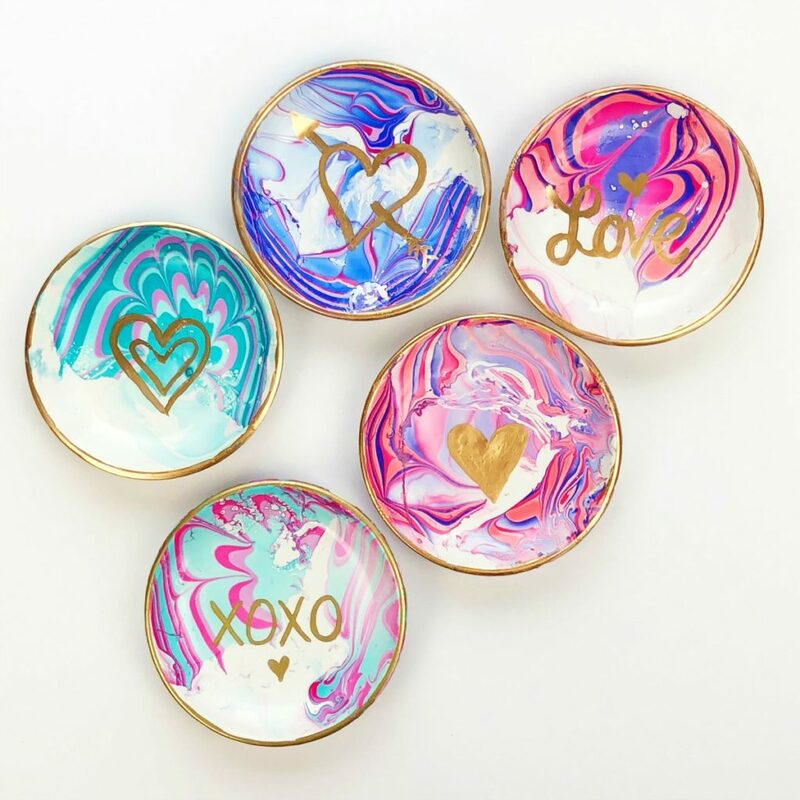 If you want to try another nail polish marbling project, check out how to marble ring dishes. So are you ready to marble a pumpkin or maybe a dozen pumpkins! Let me know if you do! I’d love to see how they turn out. You can share a pic with me on Instagram or Facebook. If you use fake ones, you can keep them year after year, create color themes for holidays too. what are you going to do with the crayons? 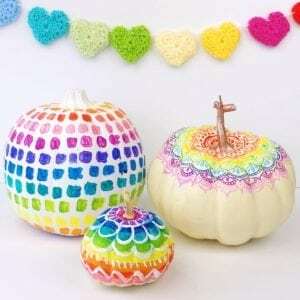 You can use the crayons to write a message or draw on the pumpkins before you submerge in to paint. It will show the design or words on your pumpkin in a raised letter design. So you can use the same technique and a small plastic pumpkin? That’s what I was thinking and you can get them very cheap too? What a great idea. Do the directions need to be any different for faux pumpkins? Nope! It’s exactly the same. I was just going to ask if fake one would work. It could, the only problem is that some absorb too much water. Better to use real pumpkins if you can. 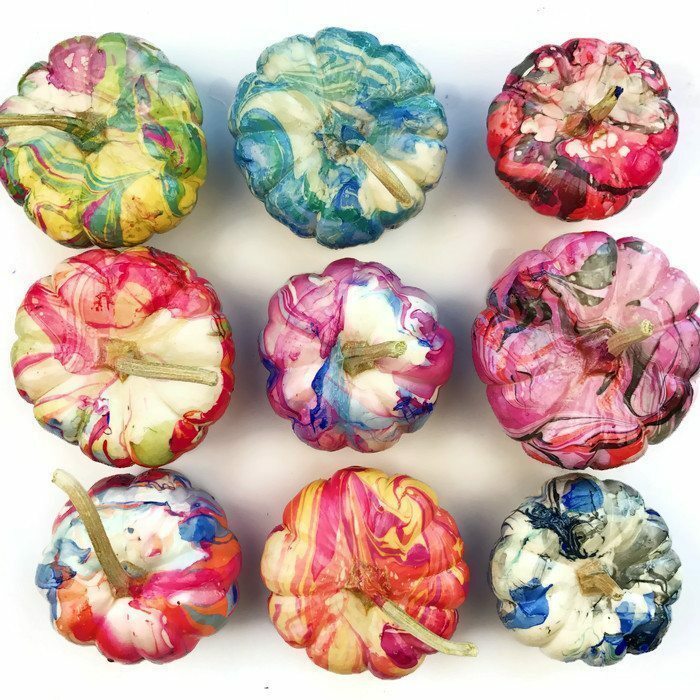 You peel paper off, hot glue them to pumpkins and use heat gun to meet to melt. Awesome effect! The wax will crack and pop off and can also stain things that it touches. Try different shades of Krylon spray paint the same way she did the nail polish. We did with my mother and used the spray paint dipping plastic flowers. To avoid the clean up, line the pail with a trash bag and when finished we put several layers of newspaper on top to absorb left over paint, pour water out and throw the trash bag away. NO MESS. Beautiful. What is the best way to dry them? I dried them on foam board but you could use wax paper or parchment paper with cardboard underneath. I tied heavy string to the stems than to a hanger. Hung them up to dry. 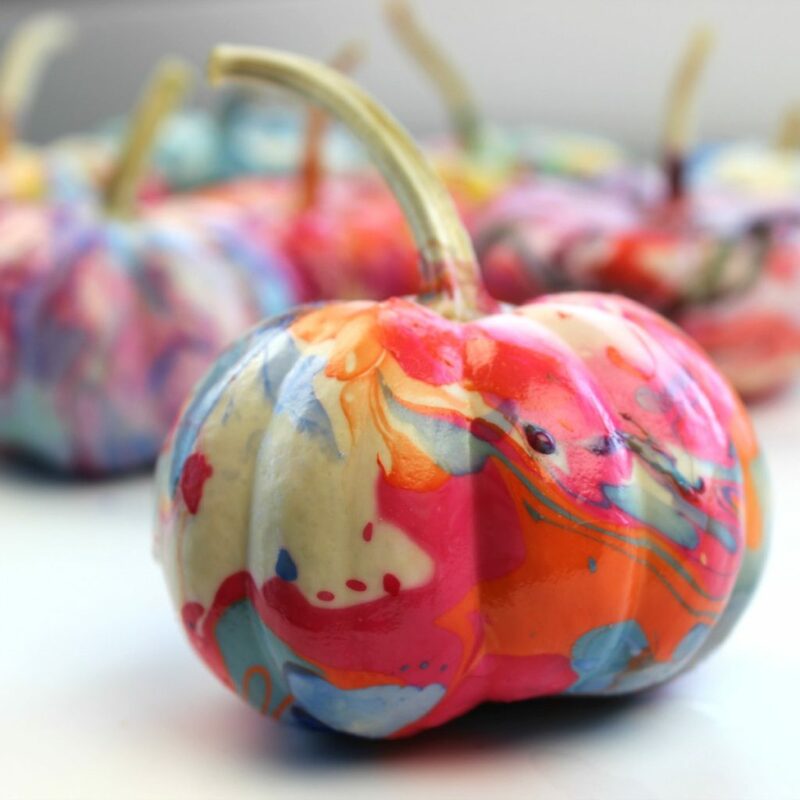 I am just in LOVE with these marble pumpkins!!!!!! I can’t wait to get going with this!! Those tiny pumpkins last for a long time!! I’m going to share this with a lot of my friends who like doing things with their hands!! It’s just such a wonderful idea!!!!!!! Thank you so very much!!!!!!!? So glad you love the idea! Love this idea! So do you know if O.P.I. works? Not sure if O.P.I will work. Sometimes the cheaper polishes work better bc they spread faster in the water. Plus they are cheaper :). Can you share the drying process? How quickly can you set them down? What do you place them on? THANKS! I love this idea! Deb wonderful idea! Thanks and looking forward to marbling pumpkins for my Grandchildren ???????? I set them stem down through the hole on our kitchen pan handle. Set a weight in the middle of the pan. Also set some marshmallow roasting sticks and put the stem through the rails. That worked, too. We set the pumpkins on egg cartons to dry. I love this idea so very much’n. Can this be done on acorns or pine cones? You might need to prime those first with white primer in order for the colors to show up but it would be fun to try! So fun! I’ll have to try that out. This looks great! Heading to the store for polish. Thank you!!! Yay!! Hope you have fun. Can’t wait for my grandchildren to come do this. They are too old to dye eggs at Easter, but they will enjoy this. That will be SO fun for them. Leta, I’m 72 and I still love to dye Easter eggs! You are never to old to dye Easter eggs!! Wondering how this would work on other media, like glass or wood. Also, what kind of glaze or paint could I use to protect the marbling (and would it work on the other media)? I can see several uses for this process. Thanks. Yes! Many years ago, I used model car paints because by containing oil, it floated on top of the water very well. I used copy paper, cardboard, white and clear Christmas ornaments, etc. when using the oil based paints, I never used anything to seal it. After marbleizing the paper, I cut them into heart shaped and glued to paper heart-shaped doilies! Was not messy at all! 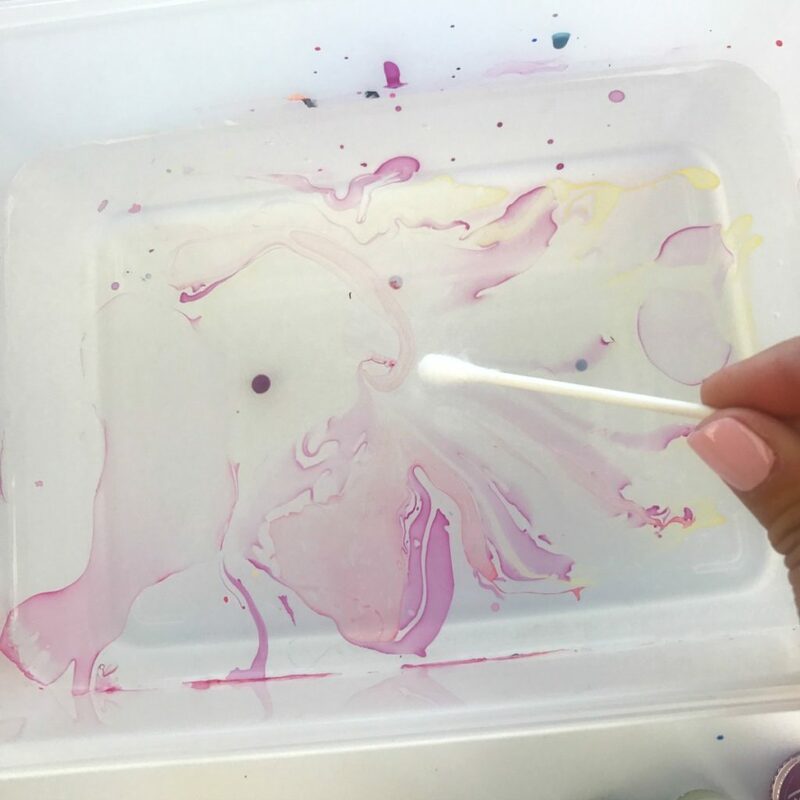 You can use acrylic paint if you put some wallpaper glue in the water and water down the acrylic paint it will float and can be used on fabric, paper, wood … try anything that fancies you. Just bought nail polish in Christmas colors for the 5 g’children ages 4-9 to put on clear glass ornaments. Will have some clear plastic ones available just in case. Can hardly wait! So once dry do u spray them or leave them , won’t they rot ? I didn’t spray them but you could use an acrylic sealant to help them last longer. Thanks so much. Was such a fun craft. What do you set the pumpkins on to dry? I put them on foam board I had but you could use wax paper or cardboard. They don’t stick to the foam board? Or wax paper? They don’t get messed up? Mine didn’t. You could also set them on top of an egg carton. Hmm, I would look for plastic ones. The foam might soak up too much water. 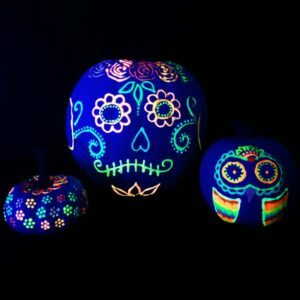 Can artificial pumpkins be used? They sure can! Just make sure they are small enough. It probably took about an hour. The top dried very quickly, but the bottom of the pumpkin took longer. How long does it take for the pumpkin to dry. Thinking of doing this with third graders at a local school. I plan on making them with students in a center with a small group at a time and volunteer supervision. How fun!! Hope they love it. Have you tried on the orange pumpkins? Just wondering if it would show up well? I didn’t try on orange. I think if you use bright contrasting colors it would look pretty cool! I wonder if the glitter nail polish would work for this progect ? Hmm, not sure if glitter nail polish would spread well in the water. If it didn’t you could just add it after you marble. I tried the glitter polish and it didn’t cover very well as the color isn’t as intense as the regular colors and it didn’t spread very well in the water, I might try just brushing some on a finished one for added sparkle. I am into gourds and I plan on trying this process with the tiny egg gourds. I love the process you come up with. What do you think about this idea? I think it would be pretty on gourds. If you can’t find white ones you could always spray them with a white flat primer. Would acrylic paint work as well? It could, but it’s a little harder to get the marbled look with paint. 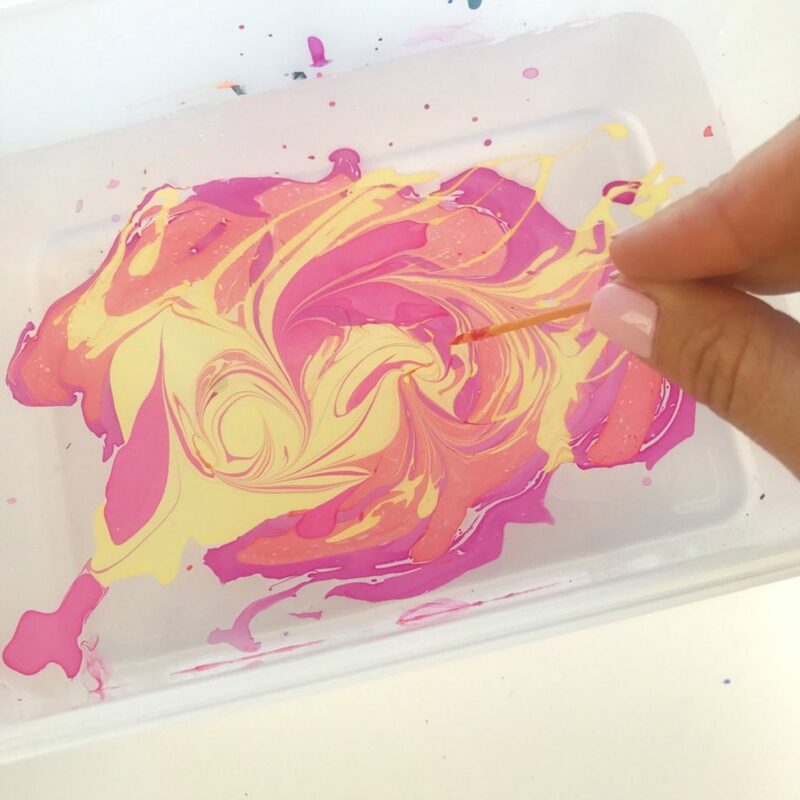 Martha Stewart has a new marbling medium that I saw at Michaels which might be cool to try. 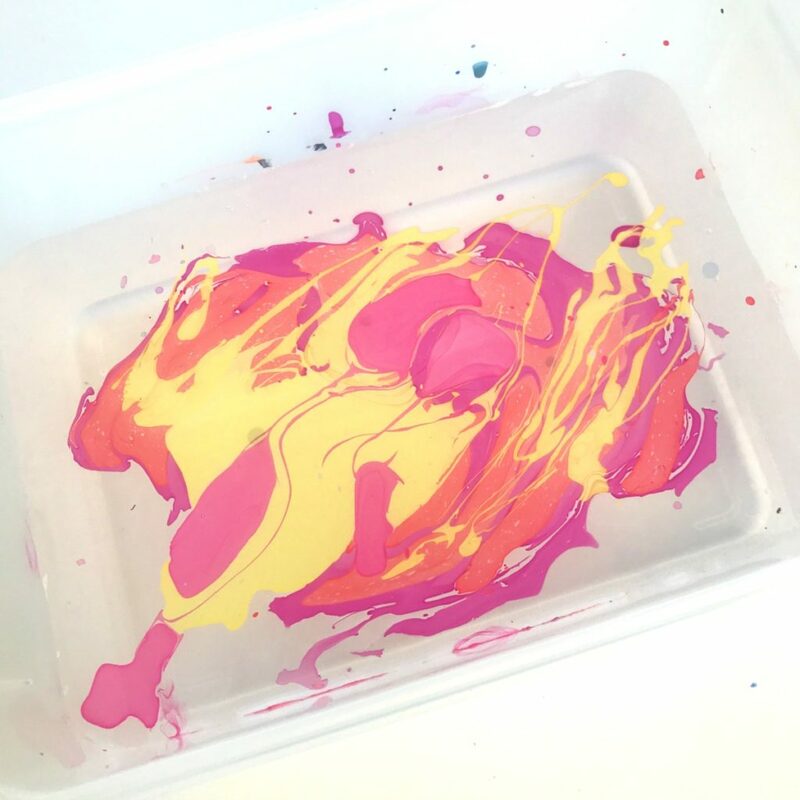 It mixes with the paint. Where did you find the brand of polish you used?Thought about getting it at dallor store.. I found mine at CVS. They also have it at Target and other drug stores. I bought mine at the Dollar Store and got many different colors as well as different colors of glitter polish too. The regular colors seemed tom work fine in the water. What else could we use apart from pumpkins?? Any ideas?? Thanks ? Gourds, ceramics, really you could prime anything with a white primer and marble it. You just don’t want it to be too large. I did easter eggs real and fake. Have you tried this with over types of paint? Acrylic or oil paints? I have 40 children I’d like to try this with and I’m not sure I can get that much nail polish ? For a large group of children I think paint marbling would be much better. I haven’t done it though so I don’t have tips but I do know that Martha Stewart has a marbling medium that I picked up at Michaels recently. You mix it with acrylic paint. I think that would be a great option. This is a great idea! I think I will do this for a team building exercise at my monthly staff meeting. Thanks! One question if I am doing this for 20 people how many bottles of nail polish should I buy? Oh wow, that’s a hard one. One bottle goes a long way. I made 12+ pumpkins using the bottles I have and most are still mostly full. I would get just get a rainbow of colors so you have variety. Make sure your room is well ventilated or you’re outside since the smell will be strong as you’re working. Have you seen the FB post about marbling on scarves? I am wondering if you could do this technique, with nail polish, on cotton t-shirts? Not sure what I am thinking but, would nail polish “work”?? HMMMM. I have seen that post! I shared it on my Facebook page. Aren’t those scarves beautiful. I’m not sure how polish would work on cloth. It might not be the right medium. Watered down acrylic paint and a marbling medium would probably work better. I’m having difficulty swirling the polish with a toothpick. The polish sticks to the toothpick. Any ideas what I can do to stop this? A few things. It might be your polish or the water temp or how quickly you are working. The polish dries quickly so the more dry it is the harder it is to swirl. Try putting your polish in all over and skip the toothpick part and see what happened! Mine were pretty well mixed even with out the toothpick. Not all polishes work well for marbling so that could be the main problem. My daughter I’d gonna have a Halloween birthday party and I think we are gonna try doing skulls instead of pumpkins. Thank you for posting this! Ooh, so fun!! The key will be to work quickly so make sure the skulls aren’t too big. Love this! Shared it with an art teacher at school. Have you tried larger pumpkins like the ones you’d set outside your front door? I’m trying to decide what proportions to use, if you’d have to do it in sections, etc. Any thoughts or advice? I think it would actually be pretty difficult with large pumpkins because you need to work very fast. 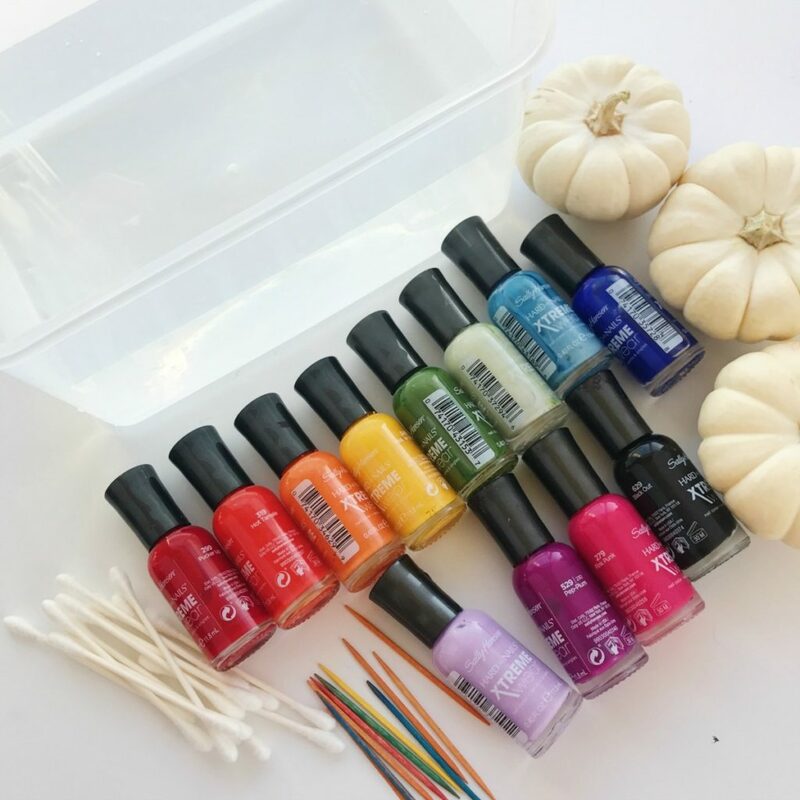 The polish dries very quickly on the water and that’s why small pumpkins are the perfect size. 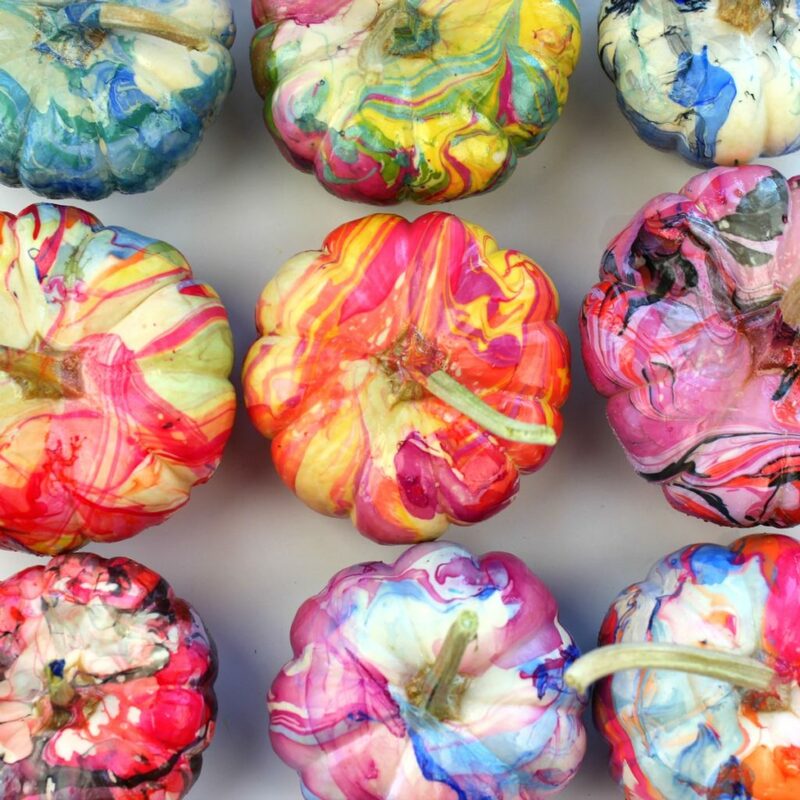 Did you see my other post about doing melted crayon art on pumpkins? That one is actually much better suited for large pumpkins. I just saw it! Thanks…will definitely be trying that one at some point this fall! I just Love it!!! Thanks for sharing ?✌? Yay! Glad you like the idea. Do you think this might also work on gourds?? These are beautiful! I think it could!! If you can’t find light gourds you could always spray paint some white. So are you using/finding white pumpkins? NICE! I’m using white pumpkins I found at Trader Joe’s. If you can’t find white you can always spray paint some white. Can you use fake pumpkins instead of real ones? Will it work as well? What other brands of nail polish besides Sally Hansen have you tried and had success? My friends and I are so excited to try this project! You could use fake ones, plastic or ceramic would probably work best. Sally Hansen really works well and they are cheap that’s why I like them. Look for other polishes that work for nail marbling and they should work on this but most of the other brands are pricier. Love this. Wish it wasn’t 11 at or l would try it right now. Thanks. Ha! Its hard to wait when inspiration hits. Thank you for sharing this. I’m definitely going to try this! Thank you for the Great idea!Have a African Missions fundraiser dinner to decorate for tomorrow and this idea is fast and will add a lot of color! Have you used any dollar store polish? I haven’t. I just know that the Sally Hansen works well bc a lot of people use it for nail marbling. This is a wonderful art project idea. I just Love it. Went to the dollar store and bought wide assortment of colors of nail polish, including glittery ones to try. Need to get real mini pumpkins but bought a couple of stone ones to try. Hopefully will trial them out tomorrow before I buy the real ones. Also bought crayons to try the crayon method too. Will post if my cheap method works! Want to do it now but I am forcing myself to wait until daylight! I didn’t like my first attempt; just didn;t get coverage I wanted so will try again. My Dollar Store polish seemed to work fine in the regular blend but glitter didn’t show up much on the glitter one. I used a stone pumpkin I had primed with white paint and it worked fine. Don’t use top coats. My granddaughters wanted to use their glitter top coats and it didn’t work. It made the solid colors race to the edges of the container. It could be “painted” on after they dry. Love this idea can’t wait to try it with my grandkids. Also, IT’S MY BIRTHDAY too. Live my Halloween Birthday and always had a Halloween party when I was younger ❤️? We did this with ink on paper. . Look up Japanese paper marbling. . Sumanigashi? Our AHG 12-18 year olds had a great time and used the marbled paper to personalize composition notebooks. This would work for Christmas ornaments too I bet! Does it work on metal like aluminum ? Not sure, but worth trying. You would probably want to spray paint it white first for the colors to show up. Would it work with a small, pie size, real pumpkin if you paint it white? Can you use white spray paint? You can definitely spray it white. I really like the white flat primer by Krylon for my crafts. I’ll add a link in the post. How do you get the polish off the bowl?? I definitely recommend a plastic container or something you don’t mind getting polish on. I would have them marble them by dipping from the side. And then add more polish to the water and dip the other sides. It will work, just might take longer. This is adorable!! I’m wondering if the pumpkins will always have that “nail polish smell”? Or does it go away once they are dry? What happened with your pumpkins? Thank you so much for sharing such an awesome art project!! ? It goes away very quickly. Mine had no smell that same day. I tried this, albeit not with the recommended polish. Definitely didn’t work. I thought “Oh I’ll try brown and orange for fall colors.” Nope, just looks like poo. The kind of polish makes a BIG difference. Not all polishes work. That’s why I put the specific brand because I know many others don’t work. I tried doing this marble design on the vase and I’m interested to try this for Halloween and Christmas decoration. Hi, I tried this with mini white pumpkins (from Trader Joe’s). My only issue was that the polish didn’t always stick to the pumpkin. It was as if parts of the pumpkin “repelled” the mixture. So in those cases I dipped again which caused a clumping. I’d hate to have to use primer on an already white pumpkin as it seems an extra step. I even tried washing and drying one and had same issue. Any thoughts? Love this project! That’s so strange. I didn’t run into that problem at all. I think it’s okay though if not every inch is covered. It probably has a more designed look to it that way. Were you using the recommended nail polish? What defines room temperature for the water, 68,70 etc. I would think room temperature water of 68 would not work as well as room temperature water of say 75. Can you shed some light on this ? So sorry, just seeing this now. Skip the toothpick part if it’s not working for you. If you don’t work fast enough, the polish dries and will stick to the toothpick. Can I put these outside when they are done or will they get ruined if it rains? Absolutely! You could also try spraying one white with a primer. What do you consider “room temperature”? It should feel very comfortable and more warm than cool. we did this with Easter Eggs this spring. Such a cool method. On my list to do with Easter eggs as well next year! Wish I could post my pics in the comments! They turned out great but I do think with practice they would get better… different brands of polish did work differently as they had different textures in the water. So glad you had success! Yes, practice definitely helps as with anything :). Feel free to come share a pic on my Facebook page or tag me on IG.